Lots of what’s wrong with the art world is touched on in the article linked above, albeit somewhat unwittingly. What the author is describing is the decadent behavior of a tiny clique that has declared itself “the art world.” They presume to speak for us all, and this arrogance, weakness, hedging, brown nosing, and posing is what they have to offer? Pathetic. We can do much better than this. The author, James Adams, begins the article with a little anecdote about painter Willem De Kooning angrily confronting Andy Warhol about the evil banality of Pop Art. The author’s intent was to illustrate how out of touch De Kooning was. I see in this vapid little puff piece of establishment flattery as the equivalent of De Kooning’s tirade. The cultural momentum in the 1960s was shifting from Modernism to Postmodernism, and the old guard were trying to shore up their status against the newcomers, to no avail. The same dynamic is unfolding now, as the delusions of Postmodernism fail and fade, reduced to a mere conceptual trinket for cloistered, pretentious intellectuals. 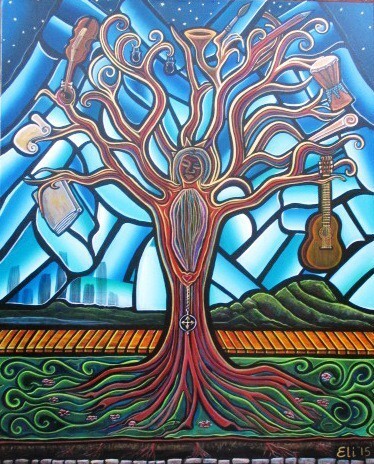 The rise of Remodernism engages art with the mass audience again, celebrating creativity as an expression of spiritual connection and communion. The empty mind games of Postmodernism don’t stand a chance in comparison to the return of art as a means joyous universal communication. So the author, part of the contemporary old guard, does his best beta male version of an attack: a passive aggressive paean to how ironic and cool he and his cronies are. He might sneer about De Kooning rolling over in his grave, but James Adams and Postmodern apologists of his ilk are the ones whistling past the graveyard now. In contemporary life, toys have been largely replaced by gadgets and product placements, just as art had been replaced by commodities and brand name recognition. The degradation of simple enriching joys into ugly trends is an unfortunate characteristic of this age, but it is not irreversible. The sense of wonder and play that both real toys and good art can create is accessible to authentic individuals who still value curiosity. 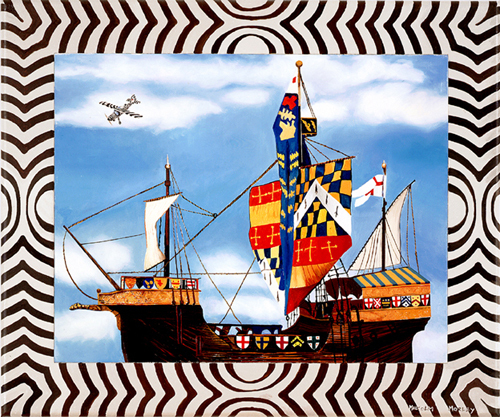 English artist Malcolm Morley understands the power and use of toys, and applies it in his art. 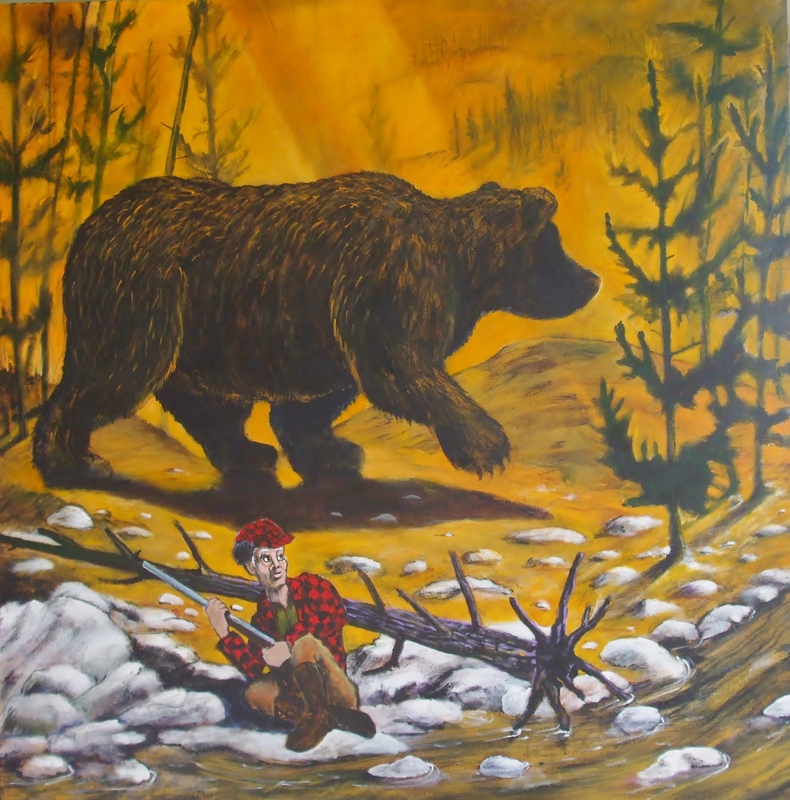 Much of the content of his paintings are based off of toys he’s found, or created himself. He traces this fascintation with toys to a formative event from his youth. 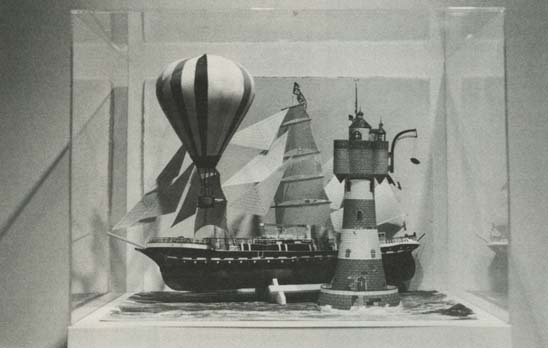 As a boy in WWII London, Morley build a balsa wood model ship and set it on his windowsill, intending to paint it the next day. That night a German bomb blew the front of his house off; the boat was destroyed. 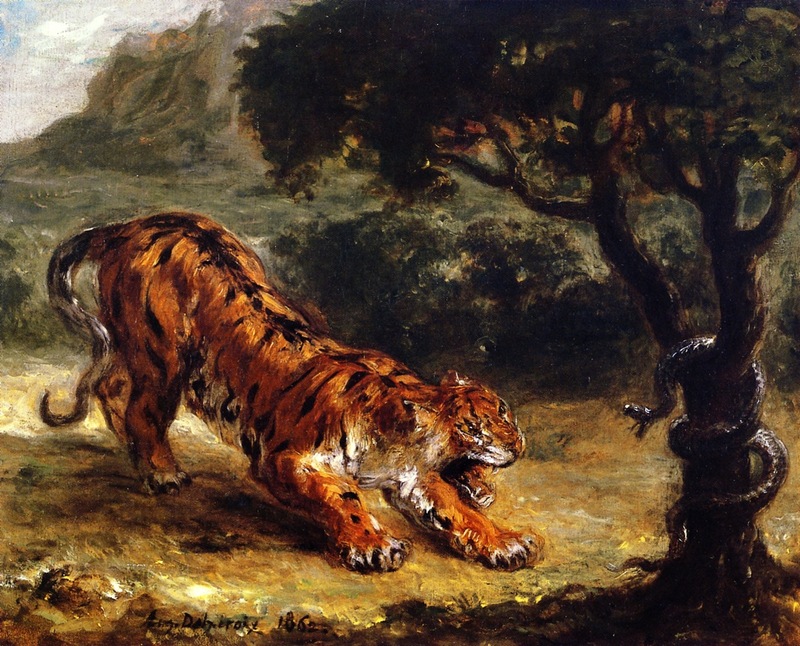 Morley’s work has evolved throughout his career; in the 1960s he could be said to have invented Photorealism, though he never accepted that label. 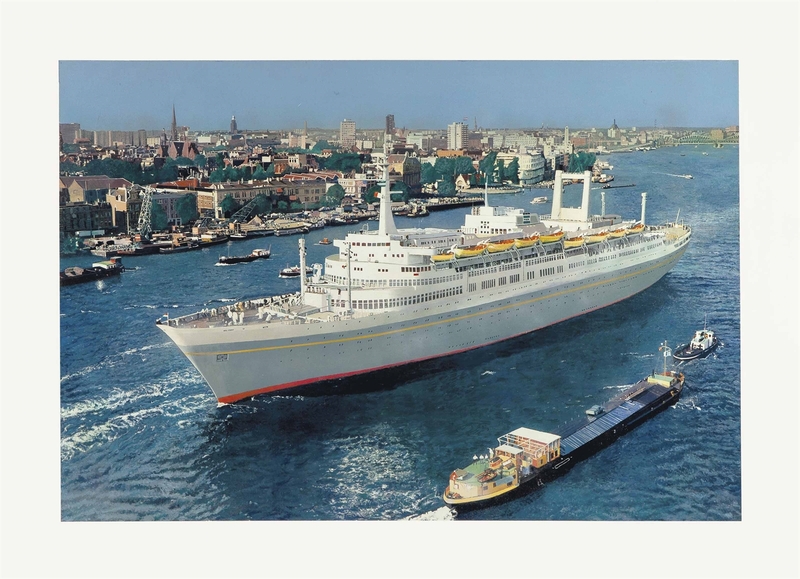 At first he painted ships-or rather, he painted from postcard pictures of ships. 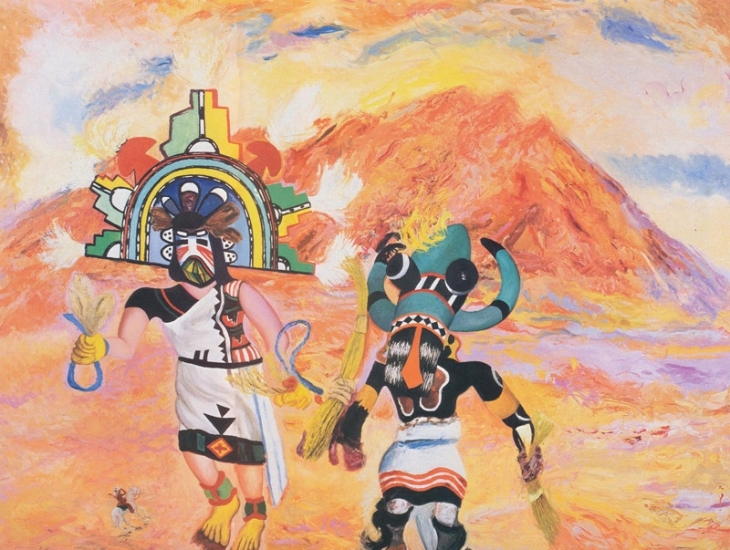 But through the years Morley incorporated toys into his artwork: using lead soldiers, kachina dolls and miniature cowboys as subjects for paintings. 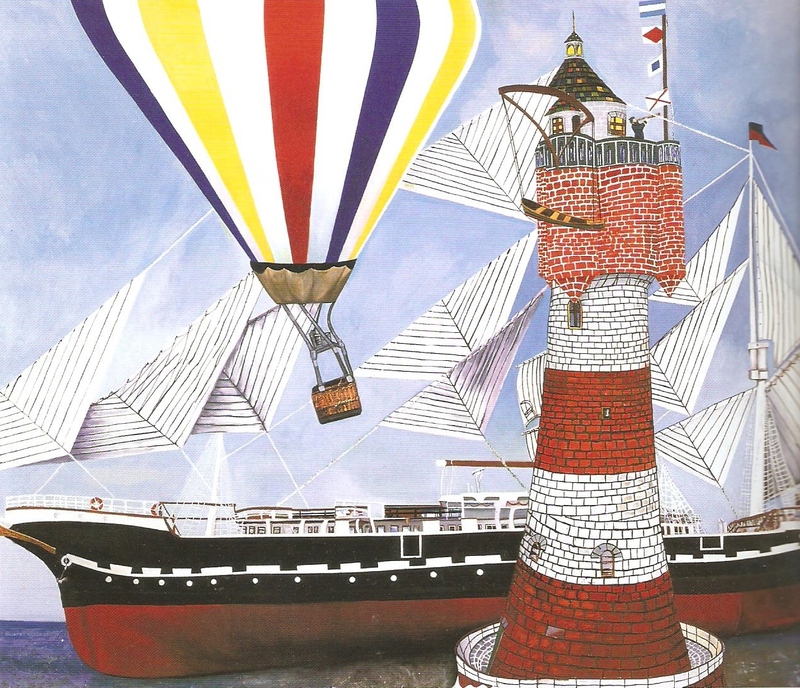 He also constructs three dimensional models of ships, planes and buildings from watercolor paper and encaustic paint, which he then uses as still life arrangements for paintings. In my own work, I want my art to have that sense of playful purpose Morley describes. Recently I had an opportunity to work on the subject of toys quite literally. The Firehouse, one of Phoenix’s leading alternative art spaces, held a toy-themed show. My contribution captured the sense of implied storytelling I enjoy so much. 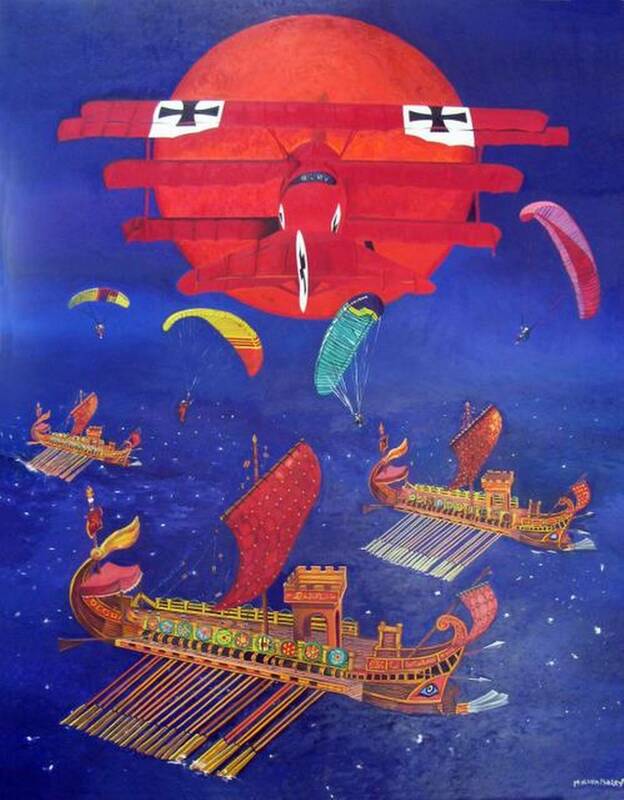 Working using toys as models was also my way of doing a tribute to Malcolm Morley, an inventive and adventurous painter. 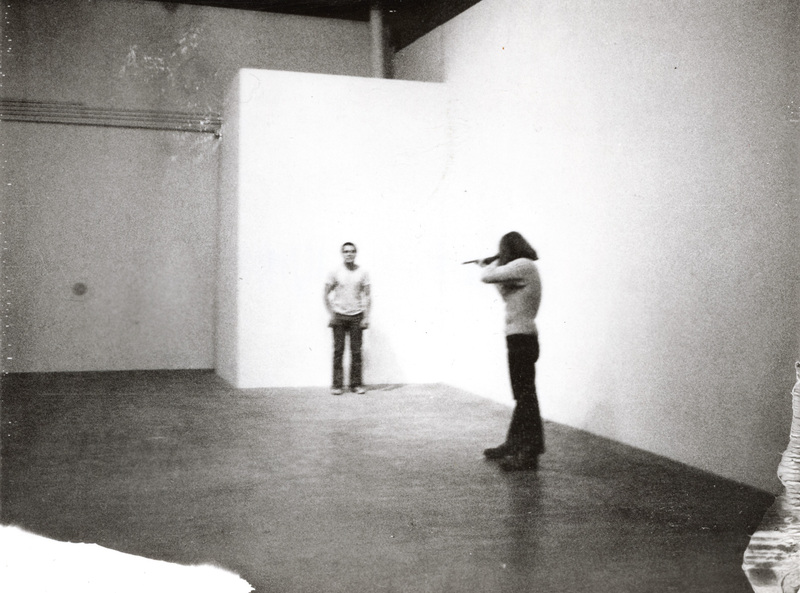 Chris Burden takes a bullet-but is it art? It’s been a long standing observation of mine that contemporary art is undergoing a crisis of relevance. The self indulgence and baseless superiority complex that informs the establishment art industry has alienated the general audience, and made the art world a tiny bubble of elitist pedants pandering to other elitist pedants. I wish there was a better commonly understood word than “elitist” to describe to presumptuous bureaucratic power players that are such a plague in our society. It’s not just the arts, all of our institutions are infected with entitled control freaks that feel they are too special to have any accountability for the results of their agendas. There’s nothing elite about them. They mess up every field of endeavor they get involved in, because all they are really concerned with is their own status and privileges. The current caretakers of our culture have been careless. They are blinded by ideology and reactionary hatred for the great traditions of Western culture. They want to tear it all down and rebuild civilization in their own corrupted image, where they, as the well-connected, will rule. How did the atom bomb make the artists think it was pointless to preserve the traditions? Because their use would do away with things, I suppose, but the end result was a culture pre-exhausted for your convenience, one that had assumed the end was nigh and spent its time making grotesque faces in the mirror. It would have been just as potent a response – more so – if they had embraced the positive history of Western Civ and exalted its possibilities, but they were a joyless lot, and the joyless feel judged in the presence of beauty. I think that museums thrived because going to a museum signified that you were a cultured person, an interesting person, a person open to new things, or at least a person who read the Style section in the newspaper. Having an opinion that was other than laudatory was judgmental, but could be excused if you demonstrated that you understood the artist’s intentions. You can read what he concludes, but I keep coming back to the same things: it’s not that art is irrelevant, or that people are indifferent to Art, Period, but that High Art has removed itself from a conversation with the culture, and now lectures from barren cul-de-sacs to acolytes in sack-cloths. The art of movies can be much more impressive than a silly video installation of disembodied lips moving in poor sync to a Brazillian folk song to indicate something poverty something Catholocism; the art of contemporary music engages where the abstractions of post-Romantic pain-inducing shriekfests just makes people feel like they’ve stuck their head in a blender full of broken glass. The students in the author’s class have strong opinions about art. Just not the stuff that’s insulated from criticism because the artist occupies the realm of the permissably pedantic. I’m more with Lileks here. I have great hope for the future. The fact that the elitist cultural industries have degenerated into such isolated, unappealing train wrecks would be a profound tragedy…if that was the only option we had. But the failures of the establishment art world is an opportunity for those who have not been corrupted by their short sighted and limited concerns. The art world is as really as big as humanity itself. In my experience everyone gets excited by good art when they see it, it’s just so much of what the elitist culture presents is not really art at all. Those who actually understand what art is, what it is for, and what it does well, are stepping into the vacuum created by establishment mismanagement. The sick system of partisan cronyism is dying, and as a new network of communication outside of their tainted hierarchies is developed, their influence will be ultimately destroyed. Great things are coming, once we clear aside the ruinous rubble of elitist mistakes. We cooked dinner with my sisters-in-law last Saturday. It was a fancier meal than we would normally make so my wife Michele Bledsoe brought her camera, intending to document the process. What began as a spontaneous goof on a cooking show intro became something more as the evening went on. Michele filmed each step, not for the purpose of making a how to video, but as a platform to reflect on the overlap between our normal efforts at art and the preparation of a special meal to share with family. The results were fascinating and extremely delicious. One of my latest paintings will be exhibited halfway around the world in July. The show is “One Love,” otherwise known as “Un Amor,” at the Festival Arte Sano X, being held in San Pedro de Alcántara, in Spain’s Andalusia region. The names of these places are like poetry to me. Not only do they sound beautiful, they evoke images of a rich and mysterious past. Epic stories of the maneuverings of Romans, Vandals and Moors, Republicans and Nationalists. Song lyrics from the Doors and the Clash. Columbus set sail from this region. Pablo Picasso, an explorer of a different kind, was born and raised in Malaga. 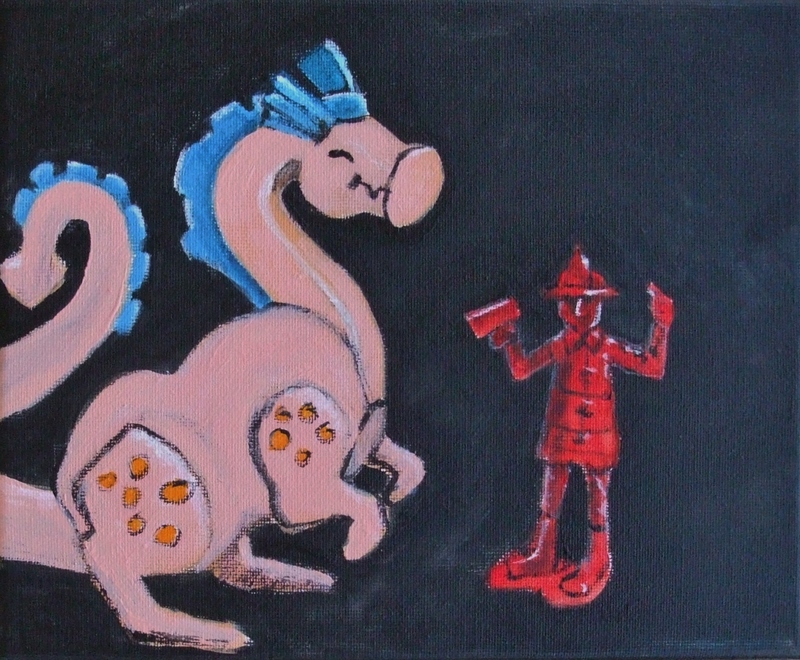 In honor of Malaga’s most famous ex-resident, I created the painting for the show in a spontaneous manner. I was thinking of the amazing film The Mystery of Picasso, which was so influential on me as a young artist. Even as I improvised, imagery and order appeared. 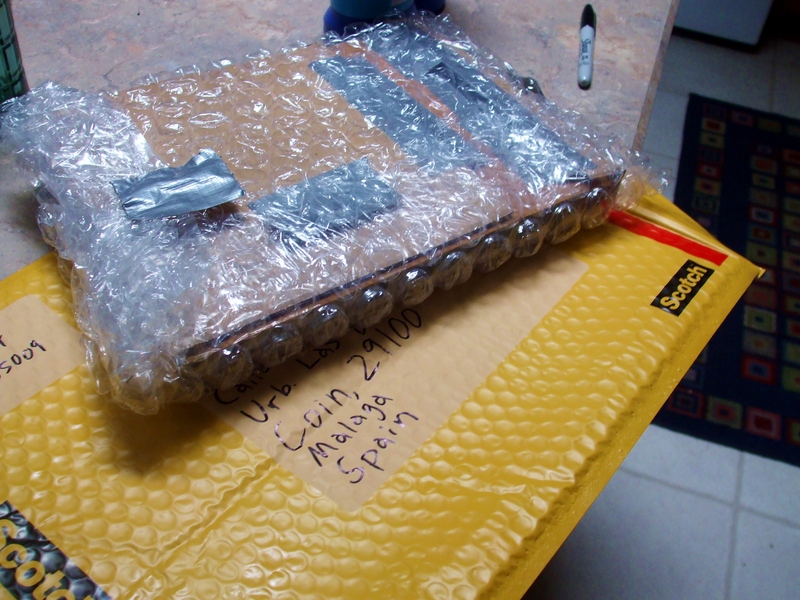 It was very exciting to package up my painting, knowing where it was going. In the best DIY tradition, this show was organized by Artista Eli, founder of Spain’s Malaga Stuckists art group. She generously invited an international crew of Stuckist and Remodernist artists to take part in a festival celebrating health and art. It’s a good fit, for the cutting edge philosophies of these 21st century art movements are a great cure for sickness and lethargy of the establishment art industry. I am so grateful to live in the age of the internet, which allows me to connect with inspiring people no matter where they are, and share our art around the world.The grassroots have gone global. I have told myself a hundred times that painting – that is, the material thing called a painting – is no more than a pretext, the bridge between the mind of the painter and the mind of the spectator. The creation of a painting acts as a model of the examined life. What do you see when you look inside? The painter has a chance to represent this inner vision for us all to experience. The work of the most inspired artists I’ve known acts as an extension of their personalities. The intuitive artist makes art that is a demonstration of their character. It is an act of faith and love to be so open with others about our own natures. To look at what many establishment contemporary artists offer, you would think their personal mental, emotional and spiritual life consisted of lifeless echoes of vapid mass media offerings, political panderings, vague recyclings of other artists’ ideas, and technical formulas. I don’t believe such limited offerings really reach who they are, and bring it out for the world to see. They’re falling short of the ultimate destination: self knowledge shared as a communion with their fellow humanity. It’s a scary place to head for, and the current mentality of the art establishment discourages it. Exploring the state of the soul is impolite; it doesn’t always look hip and savvy, and is just too raw and genuine for those who hide behind a pseudo-sophisticated façade-and façade is what the elites are all about. But the world within is the only destination worth heading for. Art is the record of that journey. On March 15 I posted a picture of a blank canvas I had just built. 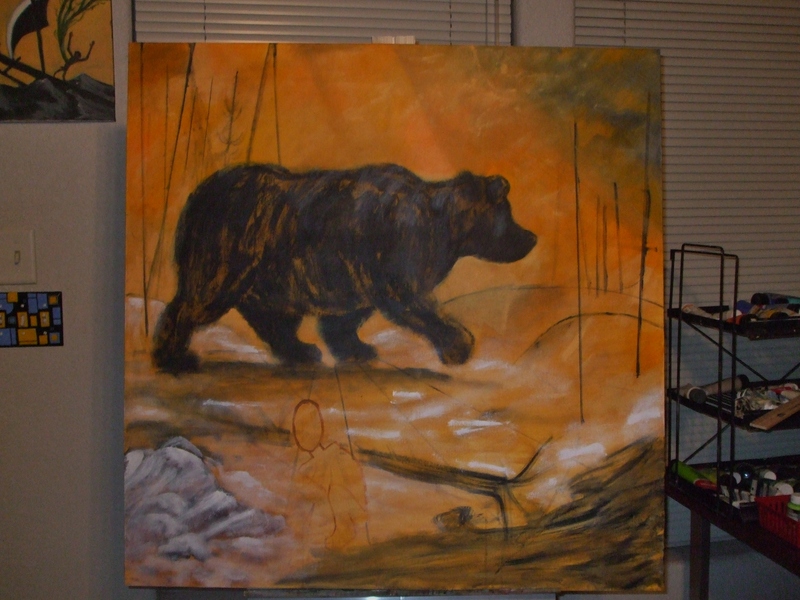 I finished the painting on Sunday June 28. As we share our studio space, my wife Michele Bledsoe and I also share observations. We’ve been able to identify how we can tell our paintings are completed. This is important for intuitive artists, working out imagery that comes from the imagination. Technically a painting is never really done. You just have to be able to recognize an effective stopping point, where the piece has reached a place of integrity: the sense of being whole, where even the contradictions are part of an overall unity. A work in progress is full of problems. As we paint we zero in on the problem areas. Each adjustment creates a new set of issues. During this process all we can see on the paintings are the problems needing to be fixed. As a painting nears completion, we start to see the entire image again. 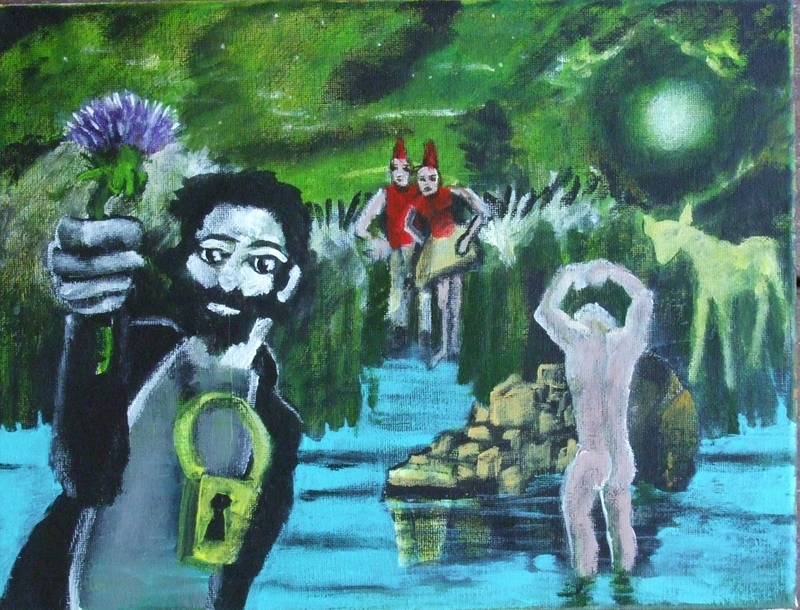 So what does my painting “A Tale of the Forked River” mean? Hopefully what I show you speaks for itself.